After a couple month trial, I’ve decided to move back to Google Reader from Shaun Inman’s Fever. Originally, I made the migration on the allure of several shiny gems: a gorgeous interface, code that I could host on my own server, a refresh rate I could dictate with cron, and an innovative approach to filtering the signal from the noise. With each feed you add, either as Kindling you read on a regular basis or Sparks to feed the fever, the links count towards “what’s hot”, a visualization of the most popular stories for any given time period based on the information flow you’ve curated. The deal breaker, however, is the mobile interface. In terms of reading experience the two RSS readers are comparable but sharing from Fever is a multi-step pain. Google Reader is at most a two-step process: open the item in a new Mobile Safari tab and hit the Tweetie bookmarklet. Because Fever is a standalone web application on the iPhone, I have to copy the link, close the application, open Tweetie, and then paste the link. I do a significant percentage of reading on the go, so it’s back to Google Reader. It’s also a golden opportunity to again rethink how I structure my information flow. The art of how people organize their RSS readers is fascinating and writing about it offers tremendous learning potential; consider this a nudge to reflect and articulate how you’re managing your information flow. My approach is to organize feeds by both priority and topic. I originally started with three priorities, A, B and C, and slimmed that down to A and B when I moved to Fever. If it’s a relatively low traffic feed with content I’m very interested in, then I’ll drop it in the “A-List” bucket. Publications that fit in this category include Daring Fireball, Nieman Journalism Lab, Publishing 2.0, Snarkmarket, and Open the Future. The “B-List” bucket acts as a second tier of importance and includes sites like … My Heart’s in Accra, /Message, and Oregon Media Central. Feeds I’d like to read/skim on the days I have the time to, or that I don’t mind marking all as read, fit into different topical buckets including Business & Economics, Education, International Development, Media & Journalism, and Technology. This functions, but I’m ready for something new with a couple of goals in mind. First, I’d like to add more feeds to my stream. 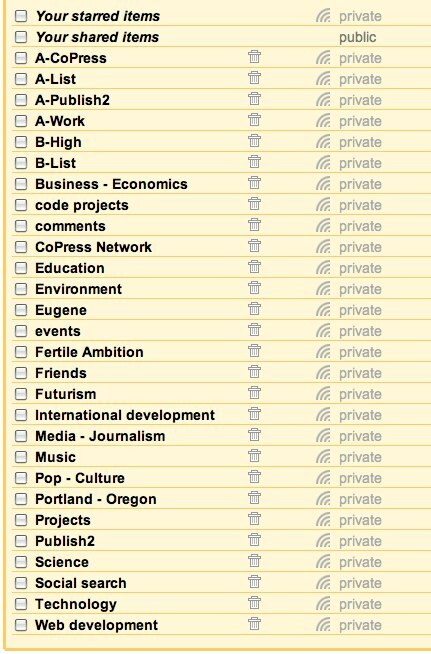 In the move from Google Reader to Fever, I culled my subscription list down to 262. This metric says “amateur web worker.” So, secondly, in the process of adding more feeds to my stream I need an approach that adds more nuance to my prioritization system. The filtering offered by Fever was this in parts, however I don’t believe I had the breadth of data to make it a useful daily tool. Whether using Google Reader’s system of folders can actually scale remains to be seen, but I shall experiment. And continue searching for other peoples’ approaches to structuring their information flow. Later: There’s an additional piece to this puzzle. I’m obsessive compulsive about getting my RSS reader to zero nearly every day. This I am proud of. What it means to my method of parsing information is that I ideally want to weight everything in such a manner that I maximize the my efforts in relation to amount of time I have. My second attempt gets a B-. I’m a big fan of services that can reliably keep my data in sync across multiple computers. Dropbox is likely my all-time favorite, and allows me to effortlessly sync 50 GB of documents, code, and media between my laptop and my desktop (ahem, .Mac). CoPress has a folder we’ve shared amongst the entire team for making accessible meeting notes, documentation, legal information, etc. Evernote, even with a mediocre user interface, enables me to quickly have access to my notes across any device. My notes are organized in the way of the GTD and I can easily search or filter by tag to get what I need. Trust, however, is a very critical component of any relationship with a cloud or syncing service, and transparency is one method for achieving it. Dropbox is a pro in this regard; every account has at least 30 days of version history for anything that’s being synced. Early yesterday, I made the move to Adium and decided that I finally wanted my Address Book accessible across multiple computers. Spanning Sync was the most obvious choice, as I’ve been using it to bring my calendar from iCal to Google Calendar and then to another iCal for several months now with no serious complaints. It’s blind trust in the service, though. Spanning Sync has a sync log, but the only way to revert to prior versions is to make your own backups and brute force it. The same thing applies to Address Book information which, in my situation, isn’t all that great of a solution. I did as clean of a sync process as I could think of to get it right the first time. The Address Book on my MacBook has the gold master of my contacts, so I backed up and did a one-way sync to Google (overwriting all of my contact data) and then a one-way sync down to my desktop. The result? I have 794 contacts on my MacBook, 743 contacts in Gmail, and 742 contacts on my iMac. It almost worked. Kinda. Spanning Sync presents two significant issues for me that also affect the amount of trust I have in relationships with cloud syncing services in general. First and foremost, the numbers don’t add up. Not all of my contacts were synced properly, while some were entirely deleted along the way, and I have no way of figuring this out until I unsuccessfully try to find a person’s contact information. Of the 10 or so numbers marked as “favorites” on my phone, 4 lost their corresponding address cards. For the convenience of having contacts synced across computers, I’m willing to deal with this to some degree. Secondly, version history needs to be more robust than a log file. Every cloud service should keep a changelog of a week or more where the user can go back and revert an object to a prior state. Intuitively addressing these issues in any web product means a greater amount of trust in the relationship. Natural Capitalism by Paul Hawken, L. Hunter Lovins, and Amory Lovins [Amazon | Google Books] – A testament, and blueprint, for how we should really be living: in harmony with our ecology. Otherwise, as the book points out, the life support systems of our planet, our ship through the desolate space, are going to cease functioning as we need them to. It holds an optimistic view of the future, though, and argues that by recognizing “natural capital” as limited and valuable, we can actually solve most of the issues humanity faces, climate change and social justice for instance, and live better at that. Personally, it has made me wonder why we don’t have hypercars and closed-loop domestic waste systems already. I’ve got a few projects for home in mind when I return, although I’m going to need to buy another copy because Anat has mine in either Pune or Israel. Water: The Fate of Our Most Precious Resource by Marc de Villiers [Amazon | Google Books] – As I’ve discovered and rediscovered this entire trip, water access issues aren’t publicised to the degree they need to be. Or at all really. Being from the Pacific Northwest and all, I’ve always assumed water flows naturally from the tap everywhere and always. That’s not always the case. Although it starts off slow, the book is definitely worth finishing. For instance, one of the many interesting theses is that the conflict between Israel, Lebanon, and Jordan is territorial largely due to water access. All three nations face water scarcity, and control of supply is integral to national security. As with so much development coverage though, India is nearly completely missed. An Ordinary Person’s Guide to Empire by Arundhati Roy [Amazon | Rediff Books] – In a vein similar to John Perkins’ Confessions of An Economic Hitman, Roy lambasts the United States, IMF, World Bank, Bechtel, and team for being authoritative, oppressive, and imperialist the world o’er. She argues that Empire, by causing social injustice and benefiting few, is weak. Her essays offer interesting perspective into how India fits into the picture.